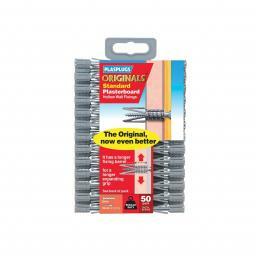 Clip pack of 50 heavy-duty, high performance wall plugs. 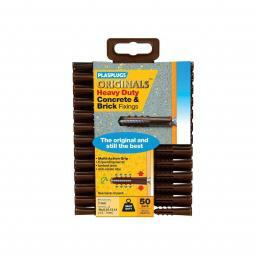 Highly versatile, they are suitable for concrete, brick, breeze block and stone. The plugs feature multi-action grips, expanding barrels, barbed jaws and anti-rotate ribs. Typical applications include shelving, curtain poles, lighting, hooks and brackets, pictures and mirrors. Accepts screw size numbers 8, 10 and 12 (4.5 - 7mm). Drill size: 7mm. Supplied with a handy depth gauge.